Scary. How soon can we surrender? What chance do we have against an enemy whose arthritic grandmothers even want to kill us -- and are packing the RPGs to prove it. Oddly enough, this picture reminded me of a story I heard a few years ago about venture capital and a bubble-era internet startup. Those were the days, back when the IAEA was still confidently if not competently assuring us Iran was not seeking nukes, and irrational exuberance was still the biggest unexploded bombshell hanging over us. An entrepreneur had gotten an internet startup going and was doing well enough by the measures of success of that day -- not necessarily making a profit but showing a good product plan and having an office with nice carpet and an espresso machine -- that it was time to solicit another round of investor money. But as the entrepreneur waited at the airport to chauffeur a potential big wallet to see his company before investing, he was worried about one problem. What if the investor saw the empty desks back at the office that weren't yet filled with new hires, and decided the startup wasn't spending its money quickly and aggressively enough? Back in those days, an overly cautious burn rate -- that is, a monthly level of losses that wouldn't leave the company penniless within the year -- could be the kiss of death when soliciting investors with eyes only for shooting stars: companies that either burn up quickly and go away, or blossom into supernovas like Microsoft or UsedToothpickAuctions.com. So the enterprising entrepreneur did what entrepreneurs do: he solved his problem. He called ahead and aked his staff to fluff the head count a bit by rounding up people off the street to fill those empty desks, pretending to be employees so the investor wouldn't worry that his money wouldn't be spent fast enough. The staff, not being fully-qualified entrepreneurs themselves, were skeptical. "What if they do something wrong? What if they've never seen a computer mouse before or don't know how to sip a double mocha latte convincingly?" But the entrepreneur reassured them. "Just round up anyone you can find and it will be ok. Investors want to invest, and they just need to be shown what they want to see." So the staff quickly rounded up a few people who were passing by -- perhaps even some little old ladies just like Michelle Malkin's rocket-wielding-Granny Of The Day. They quickly instructed the "new hires" to sit at the desks and not to say a single word no matter what. In exchange, they would contribute to the corporate burn rate to the tune of a few dollars and all the espresso they could drink. And you know, it worked. It actually opened the great wallet. It doesn't really matter whether old ladies actually know how to hold a mouse or fire an RPG; that's not why they're in the picture. They just need to give the viewer room to see what he wants to see -- or what he's afraid of seeing. Entrepreneurs and Jihad leaders understand this: when trying to seal the deal with those who already want to believe, you just have to create the right image and let human nature do the rest. Not that there is any moral equivalence between the entrepreneurs and jihadis; I LOVE entrepreneurs, even if I can't sip a latte like a pro. 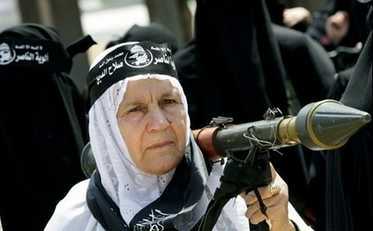 Still, I just can't quite see our guerilla granny sipping a Caramel Macchiato properly. The image just doesn't work for me. So maybe there is still room for a glimmer of hope for us in this never-ending conflict, if not actual irrational exuberance. // posted by AbbaGav @ 7/20/2006 06:47:00 PM | | | Permalink | EmailThis!